I am extraordinarily lucky to have an aunt who has an apple tree on her farm. I’m additionally blessed that she has no interest in using the apples from her tree. 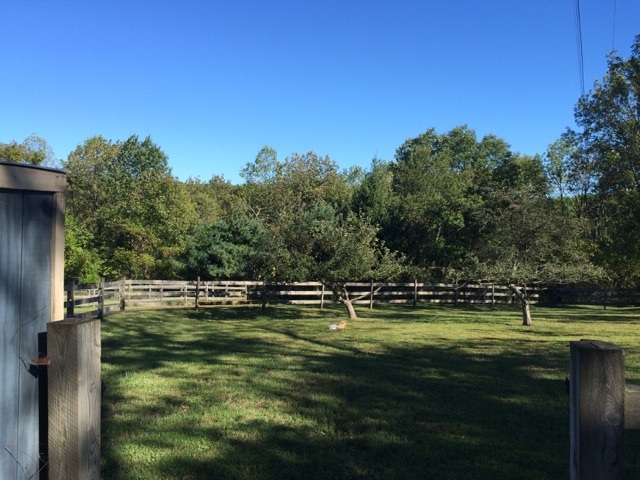 The story goes that the previous owner of her farm planted the tree in order to make wine. I am not sure if he ever achieved this dream, but I am happy to take up his mantle. The tree sits in the middle of what used to be a pig pen. It hasn’t been attended too for several years and has been allowed to grow more or less wild. My aunt admitted that she has not sprayed the tree, so it is just about as organic as you can get. With all of this in mind, I started my journey by picking the apples from the tree. As I was collecting apples from the gnarled old tree, positioning my precariously placed ladder to pick the best fruit, I felt connected to the spirit of cider making. When you are not only juicing the apples, but actually picking the apples from the tree, you are truly starting from scratch and taking the cider into your own hands. On that day I was able to collect about 60 lb of fruit. I was unable to pick from the highest branches, but still felt good about my yield. 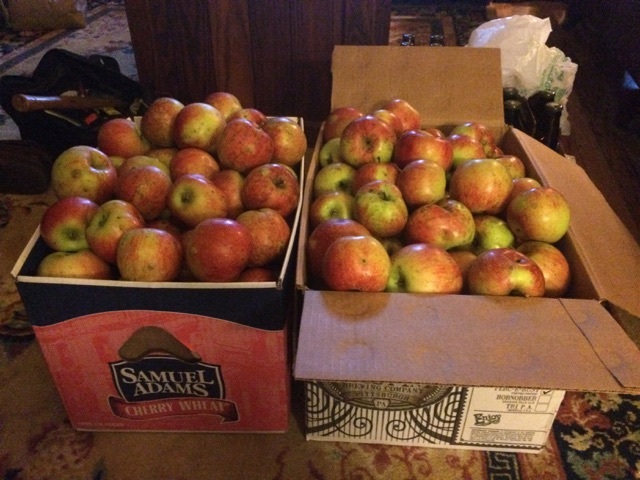 From what I had read on line, you will get approximately 1 gallon of cider from 15 lb of apples, so I was looking at around 4 gallons of potential juice. Upon arriving home with my haul, I had to determine how I would extract the juice from my apples. Unfortunately, I do not have a cider press handy, so I had to be creative with my extraction. From a previous health food kick, I had a juicer handy and decided that it would be the best way to extract my cider. 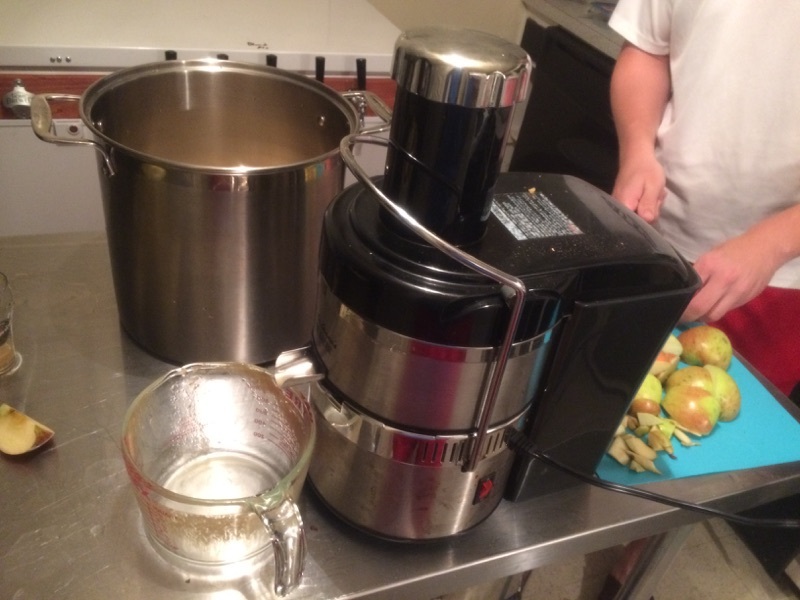 With the help of my friend Kevin, I was able to juice around 1.5 gallons of cider… until the motor died on juicer. After a moderate amount of cursing and general messing around with the juicer, I gave up and decided to try another method. 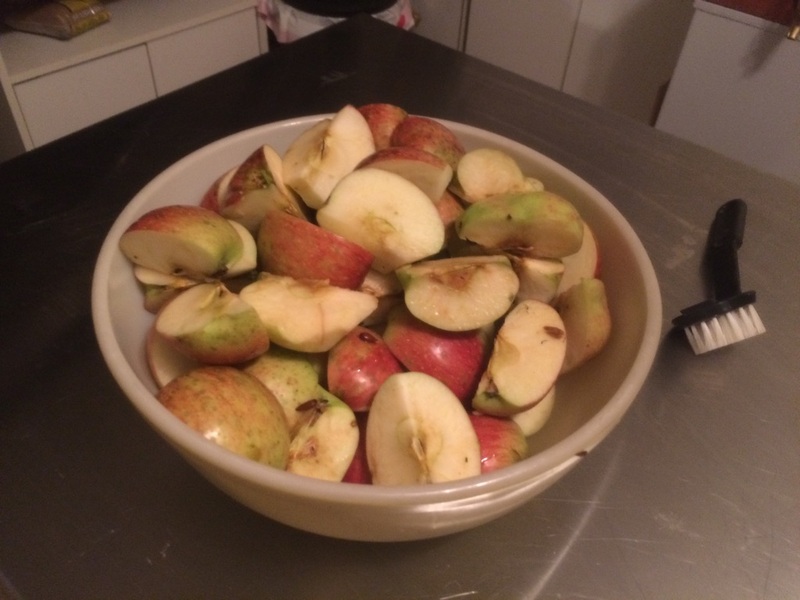 I took my handy food processor and shredded my apples. I then “hand” pressed them in my fruit bag (the nylon bag I use for the pulp when brewing fruit wine). With one of us holding the bag and the other squeezing, we were able to extract a good amount of juice from the pulp. While this method worked, I would recommend working with the juicer to avoid some headache and aid in your yield. One note is that the cider produced from the juicer was more tannic and structured than that produced by the fruit bag method. Since tannin is what gives backbone to cider, I was happy to have this component in my juice. Finally, after Kevin went home for the evening, I was able to get the juicer working again and finished extracting the juice. With my juice in hand, I had to decide what to make with it. Since I may not have the opportunity to ferment from whole apples again this year, I wanted to brew at least 2 different apple beverages. After waffling between English cider, Wild cider, French cider, New world cider, New England cider, Cyser, Applewine, Ice cider, and Graff; I settled on a simple new world style cider and a classic applewine. After tasting the juice I decided that the apples were somewhere between sharp and bitter sharp variety (For more information on Apple Varieties Click HERE). I was elated at this discovery, since it meant that I would not have to tinker too much with acidity and tannin. For my cider, I went with my classic cider fermentation process which I have used in the past with quite a bit of success. Two and a half gallons were dedicated to this half of the project. I pasteurized the juice with 2 1/2 campden tablets, while adding 1 1/4 teaspoons of yeast energizer and 1 1/4 teaspoons of Pectic Enzyme. I transferred to the carboy and allowed the sulfate gasses to disperse for 24 hours. I then pitched 1 packet of belle saison yeast. While this is not a classic strain to use in a cider, I wanted to give the cider a bit of a unique funk. 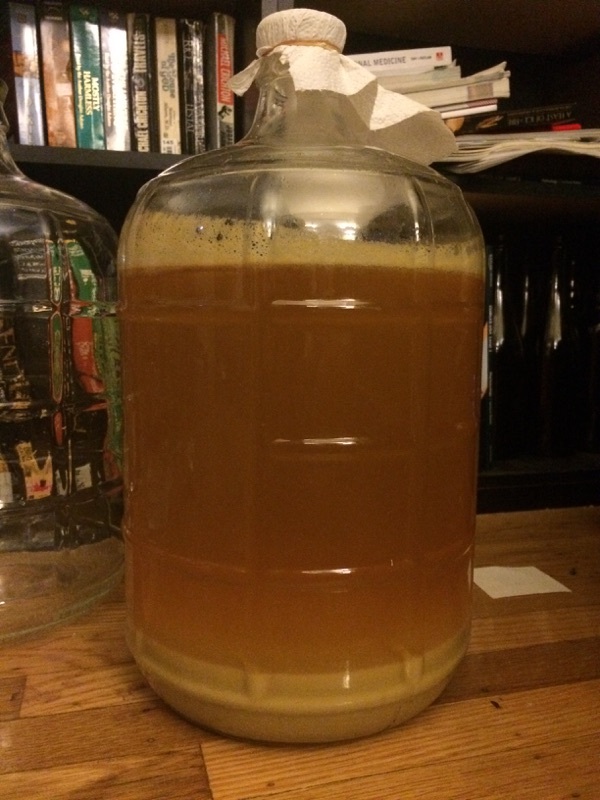 Additionally, I wanted this to cider to ferment quickly and clear rapidly, so this yeast fits the bill perfectly. The plan is to rack to secondary after 2 weeks, then bottle to approximately 2.75 Volumes of CO2 in Champagne bottles. For my applewine, I decided to follow the basic instructions from EC Kraus with a few changes. Instead of using Cane Sugar, I went with Corn Sugar in order to dampen the possible off flavors of the latter sugar. Additionally, I decided to let the acidity and tannin stay where they were and not add any additional acid or wine tannin. If later on I find that the tannin is too low, I will put the wine on oak or add some liquid wine tannin. 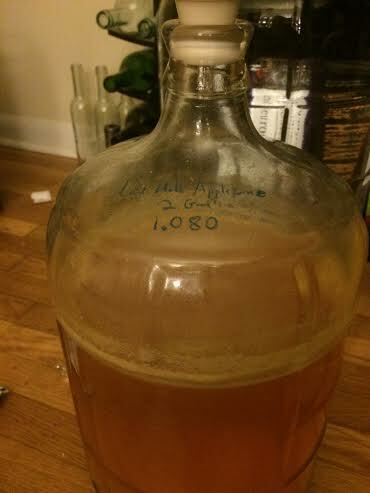 I pitched Lavlin EC-1118, a yeast which has a very good reputation in both dry white wines and ciders. The goal is to rack to secondary after 2 weeks, age for a month, dose with metabisulfite and sorbate, age for 2 more weeks, then bottle. I think that what this project has taught me is how easy it is to make cider, even if you are starting from scratch. Lets be honest, our ancestors fermented this beverage successfully with much less equipment and far fewer resources than we have today. If they could make some refreshing cider, there is no reason why we cant do the same. Go out, find a friend with an apple tree, and do your best to make some tasty cider. 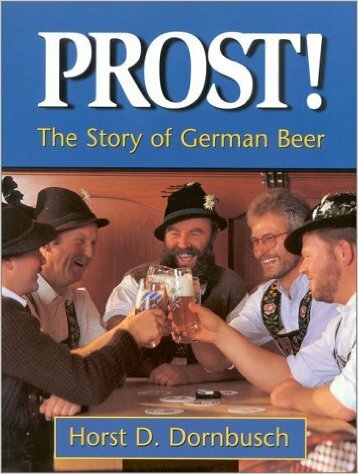 This book is a wonderful primer on the rich history of German beer and brewing. Dornbusch takes us on an adventure spanning 3000 years, from the brewers of the fertile crescent all the way to modern German brew masters. It is a great book for anyone who loves both interesting history and well crafted beer. History truly comes alive as you flip through the pages of this outstanding history book. In the beginning, Dornbusch describes the origins of brewing, starting with the first accidental batch of homebrew. He then explains the progression of brewing in the ancient world, explaining the socioeconomic impact that beer has had throughout time. We learn how inseparably tied the bakery and the brewery were and what a huge impact beer played in the lives of every day people. He then marches forward, discussing the role of the church and the state as they battled for supremacy over what could reasonably be described as the most important beverage of their existence. The book weaves through time, highlighting various landmarks in German brewing history. Towards the end of the book, Dornbusch tells us about the evolution of modern German beer styles. We learn about the rivalry between the Cologne Kölsch and the Dortmunder Alt beer, along with many other fun and unique facts about the beers we know and love today. It gives the drinker a whole new perspective when they discover the history inside of their beer stein. Some of the beers covered include: Hefeweisse, Dunkel, Alt, Kölsch, Pilsner, Helles, and many others. As a huge beer nerd and a general lover of history, I could not put this book down. Not only is the information interesting, but the writing style is very entertaining with a definite element of the author’s pleasant personality coming through in every page. The only flaw to this book is the flow of information, which seems to skip around through various points in time. To the author’s credit, he does an excellent job making a cohesive tale out of a chaotic history. Overall it is an excellent read and I would recommend it to anyone who loves brewing history. With Halloween and Thanksgiving around the corner, it’s time to start thinking about homebrew for the holidays. For me, the perfect beer for this time of year is a solid pumpkin ale. It encompasses the spirit of the changing seasons and makes a perfect transition from my light summer sippers to my hearty winter ales. But what makes a good pumpkin beer? I think we all know it when we taste it. There is a strong malt backbone, a thick rich body, restrained sweetness, solid pumpkin taste, and a just a hint of spice. So, how do you get those characteristics in your beer? A great beer always needs a great base recipe, and pumpkin beers are no exception. You can load it up with pumpkin, get the ideal spice mix, and ferment to perfection, but if you have a bad recipe your beer will never be great. You have a bit of choice in the style of beer you want to start with. While a nice amber beer is the classic base for pumpkin beers, there is no need to stay within that guide line. In the past, I have made pumpkin porters, saisons, and barley wines. There are only a few guidelines I would recommend when picking your pumpkin beer’s style. First is to avoid styles which over accentuate hops, such as pale ales and IPAs. These are great styles on their own, but they can clash with the pumpkin flavor. Additionally I would avoid any beer where the style demands a sterilely clean flavor, such as pilsner or helles, where pumpkin might show up as a perceived flaw. Finally, stay away from beers that demand overly estery yeasts (bubble gum and pumpkin… yum!). Other than these three “rules” any beer is fair game for pumpkin beer. I am personally more attached to the classic amber ale, but it all depends on your taste. When choosing a grist, you can start to have some fun. Pumpkin beers provide an excellent template to experiment with some of the more unusual malts. For a crusty type flavor to add to your beer, consider using biscuit malt. If you want a sweeter flavor, use some lighter malts such as Crystal 10 and 20. Smoked malts such as cherry wood and mesquite can lend a phenolic edge to your beer. finally, something like special B can imbue the beer with rich dark flavors. Here comes your next big choice in planning your pumpkin beer, fresh pumpkin vs canned pumpkin. This debate is really about personal preference and, let’s be honest, how lazy you are. Canned pumpkin, while considered by many to be the “cheater” method, but it actually yields very nice results. Not only will this allow you to skip hours of tedious labor, but it also eliminates the risk of a bad product. It’s important to remember that pumpkins are an agricultural product and flavors definitely vary from patch-to-patch and as a result your beer will vary from batch-to-batch. 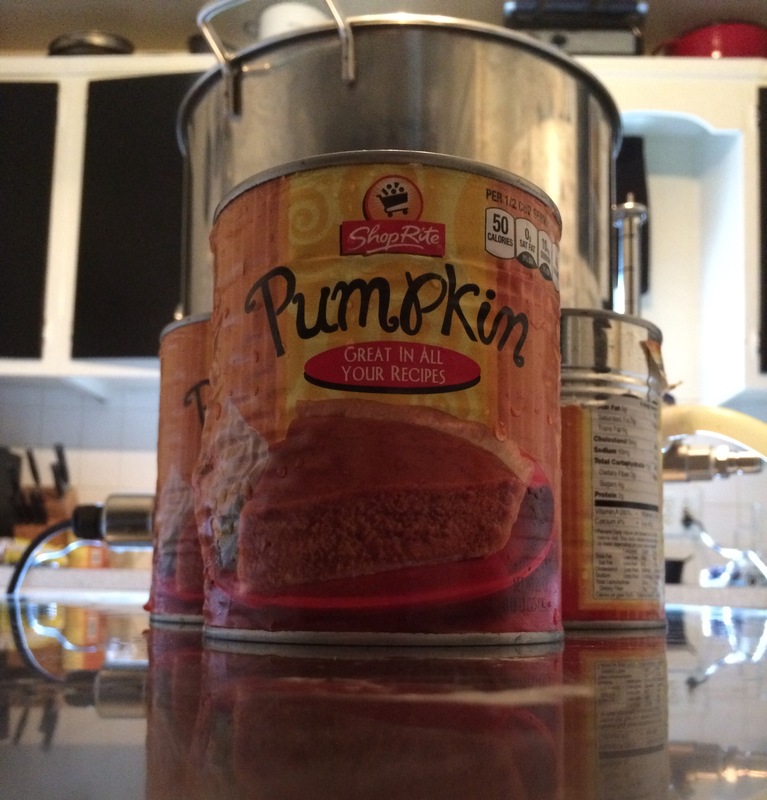 Canned pumpkin, as a processed and homogenized product, eliminates some of this risk. The most important thing to remember is to pick a product with no preservatives as this which can interfere with your yeast. Now, if you want to be hard-core and make your pumpkin puree from scratch, you have to keep a couple of things in mind. The first is your choice in pumpkin. Make sure to choose a pumpkin which is designed for pumpkin pie or savory dishes. This means that your kid’s carving pumpkin is not going to fit the bill. There are many varieties of pumpkin which can be used, but a few of the easiest to find are sugar pumpkins, cheese pumpkins, and cinderella pumpkins. A full list of pumpkin varieties can be found HERE. Now comes time to roasting your gourd, a good simple technique is to split the pumpkin, remove the guts, and bake face down in a 400 degree oven for about 30-45 minutes (till a knife easily pierces the flesh). Next scrape out the flesh and add it to your mash or boil. The key here is the roasting of the pumpkin, allowing for caramelization and maillard reactions. I would recommend staying away from uncooked pumpkin, since raw pumpkin can be sharp and give a very vegetable like flavor. One of the biggest mistakes a pumpkin beer brewer can make is adding too little pumpkin to their beer. Pumpkin has a very subtle flavor and can be easily lost in beer. Many people take this to mean that there is no point in adding pumpkin and instead focus on the pumpkin spice. Now, a great beer can be made with spices alone, but with a little bit more effort you can have both rich pumpkin flavor and complex spicy notes. The key is adding ample pumpkin to your beer. My personal minimum is 1 lb of pumpkin per gallon of beer, but I would not be opposed to adding much more. The timing of pumpkin additions is also crucial. Pumpkin can be added to the mash, the boil, and during fermentation; each one of these additions gives a different aspect of pumpkin flavor. I personally prefer to made additions during the mash and the boil and skip the fermentation addition. This is more due to a personal hang up on infection risk rather than a disbelief in the efficacy of the addition. At the very least, I would recommend adding pumpkin to both the mash and the boil. One of the factors which can really make or break a pumpkin beer is the choice and ratio of spices. Of course the easiest method is to pick up a pre-made spice mix. One thing you get with a pre-made mix is consistency, so you can easily replicate the results time and time again. McCormick makes a very nice pumpkin pie spice mix with the classic cinnamon, ginger, nutmeg, and allspice. While this is definitely an acceptable method, part of the fun of home brewing is experimentation with flavor. Creating your own spice mixture allows you to think outside the box and create something unique. The classic pumpkin pie spice mix is Cinnamon, Ginger, Nutmeg, and Allspice usually in a 12:4:4:1 ratio. That being said, there is no need to stick to this mix. If you like more of a hot/spicy then kick ramp up your ginger. If you’re into a deep nutty flavor, then make nutmeg your number one spice. Now, just because these are the classic spices, it doesn’t mean that you can’t go wild raiding the spice drawer. Vanilla complements pumpkin beer very well, giving a great mellow backbone. Fresh “raw” ginger gives a more sharp and vivacious note to your brew. You can even go hog-wild and try fenugreek, which gives a maple syrup like note to your beer. My only word of caution is to use moderation with your spices. Too many spices can give you a muddled flavor that brings your beer from complex to over complicated. My suggestion would be to stick with 4-5 spices at most and experiment with one variable at a time. Sources definitely vary in the amount of spice which is appropriate to use in your batch. Some people say 1 teaspoon while others use as much as 1 tablespoon. One of the most important things to remember is that you can’t take the spice out once it is in. A safe amount would be 1 teaspoon but up to 1/2 tablespoon would still be reasonable. If you are uncertain about the amount of spice you want, start small and work your way up. Remember, you can always add more spice later! Personally, I am highly conservative with my spices, since a heavy hand can ruin a beer. Unfortunately, too little spice can also lead to a less than desirable beer. One way to remedy this situation is to make a tincture to add post fermentation. Simply take your preferred spice mix and add it to vodka, then allow it to soak for around 2 weeks. Once the flavor has been extracted, simply add as much of it to your beer as you like. Using the tincture method allows for more precise control over your beer and can decrease the risk of a disappointing brew. You can find an article on making tinctures HERE. Now, here is where things get interesting. Once you have established your base beer, you have a number of different options ahead of you. One very popular technique is fermenting inside of a pumpkin. The theory behind this is that you will be extracting even more “pumpkin” flavor. In my opinion (which is by no means the final word on the subject) is that this presents more problems than benefits. For one, the control over microbes is pitiful in this technique and you have the recipe for a nasty infection. Secondly, raw and uncooked pumpkin has a very sharp and vegetal taste which will do little for your beer. If you are interested in the novelty of using a whole pumpkin, I would suggest serving your homebrew in a pumpkin. This is technique is both fun, safe (for your beer), and can even add some extra complexity if you flame the inside of the pumpkin. A very good article on making a pumpkin cask can be found HERE. Another option you have at this point is the addition of oak to your beer. Oak, with its rich vanilla and roasted flavors blends wonderfully with pumpkin and pumpkin spice. If you are only making a small amount of beer, I would suggest going with simple oak chips. While these cheap little guys are very one-dimensional in taste, their cost outweighs their simplicity, especially on a small scale. For the pumpkin beer connoisseur, I would suggest oak cubes or spirals. With a larger amount of surface area and greater selection of styles to choose from, these oak products are perfect for those who want some serious oak in their pumpkin beer. Finally, If you are lucky enough to find a bourbon barrel or just freaking love pumpkin beer, an oak barrel is the perfect vessel to hold your brew. I would suggest saving the full barrel for a high gravity or imperial pumpkin beer since a longer time will be required to extract the most out of the barrel. As a rule of thumb on oak, the higher the toast provides more smoke and vanilla while the lighter the oak will provides butterscotch and coconut flavor. American oak is more aggressive in flavor, while French oak has a more subtle tone. Finally, and possibly most controversially, you can consider using something other than pumpkin in your pumpkin beer. “Gasp, you blasphemer!” says the crowed. Alright, hear me out on this one. Pumpkin is a great gourd, but it is far from the most flavorful species in the squash family. In fact, the pie industry caught on to this and actually makes many of its so called “pumpkin pies” from butternut squash. I know how you feel, but the sense of betrayal will soon wear off. Going outside of the pumpkin can be a bit intimidating, but nothing ventured, nothing gained. Good substitutions for pumpkin include sweet potato and butternut squash. Give it a try some times and when people ask what makes your pumpkin beer so flavorful, just give a wink and say its your secret ingredient. This is my most recent attempt at a pumpkin beer. I loaded up the pumpkin and used ample amounts of pumpkin spice. I used a classic amber base and mashed at higher temperatures to give some residual sweetness. Notes: I mashed at 155 for 1 hour to provide more body and residual sugars. Mash was a bit sticky so I added some rice hulls in order to aid in lautering. For me, one of the most frustrating aspects to brewing sour beers is the wait time before you get to drink the beer. Even the quickest turn around sours will still take around 3 months to finish (with the exception of sour mashing, but that’s a different story). More often than not, I’m willing to take on a long wait for a big payout. However, there are occasions where my brewing schedule wont allow me to use a brew day making something I wont be able to enjoy for a year or more. On these rare but regretful occasions, I take the middle path and do a split batch. The concept of split batch brewing is incredibly simple. Take one wort, put it in two different fermenters then BOOM you have a split batch. With this grossly simple overview covered, there are a number of options for you to choose from. The first thing to decide is what sour you want to start out with. From there you can determine what your non-sour beer will become. I’ve outlined a few options for transforming a sour base beer into something unique and exciting. One idea is to match your sour style with a complementary non-sour style. Many beers in the sour category line up very well with the “standard” beers set forth by the BJCP guidelines. If your making a Lambic or Geuze, you can make the other half of your batch a wiezen. Considering that a large portion of a lambic’s grain bill is wheat malt, and the hopping rate is low, transforming the recipe into wheat beer is an easy shift. I would stick with a classic German krystal or hefeweizen, rather than an American wheat, as these styles most closely match the lambic malt and hop bill. Oud bruin’s vital statistics are almost in lock step with those of a Northern English Brown ale. By using a nice hearty English yeast strain you could easily make this beer into a complex malty version of the classic English staple. Unfortunately, Flemish Red ales do not have a perfect correlate, but they can become the base of a number of excellent beers. You could turn your Flemish Red into a rustic Saison, a Belgian Specialty ale, or even a fruit beer. Other than matching style you can add a number of adjuncts to transform part of your wort into something completely unique. Apart from matching style, you could also doctor your wort to make something completely new. In an episode of Brewing TV, the guys used Dark Belgian Candy Sugar as one of the sole darkening agents with a very light beer base. Since Belgian candy sugar can be used after the boil, it provides an excellent adjunct in the carboy. Along this line, you can use another sugar to boost up the alcohol of your non sour beer without changing any color. You could use light Belgian candy sugar to transform a lambic into a Belgian golden ale or ample honey to create a braggot. Finally, you can use cold steeping of dark grains to transform a Flanders red or oud bruin into a Belgian stout. There are a number of other ways to doctor your non-sour beer in order to make it something unique. 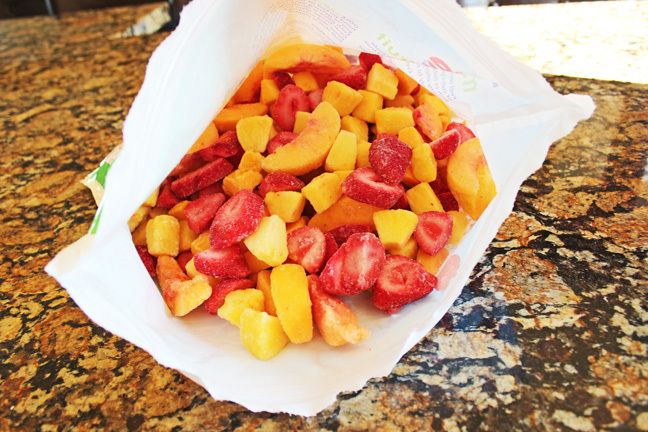 One excellent way of doing this is by adding Fruit. The choice of what you add is up to your personal preferences and possibly what is growing at the time. 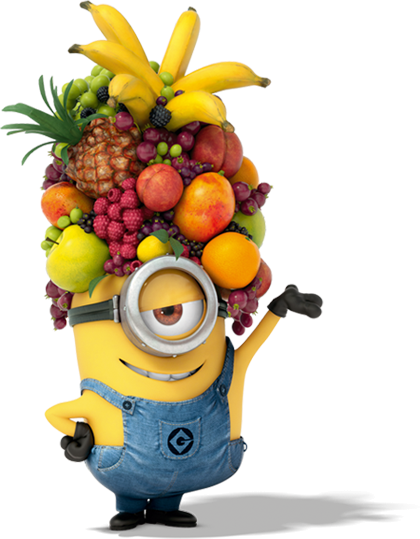 I think that exotic fruits and fruit blends are a lot of fun and can give you something rare. If you want to stick with tradition, cherries (for a kriek like beer) or raspberries (for frambois type style) would be the way to go. Very interesting beers can be created by the addition of oak. It can turn a boring and bland beer into a rich blend of vanilla, smoke, and coconut. Finally, if you find that your base beer lacks a any interesting character, you can try dosing it with some tinctures. One final thing to keep in mind is the how much of an effect temperature has on the fermentation. If you are lucky enough to have multiple areas to ferment, you can pick a specific area for your sour and another for your non-sour beer. If you limited to one area to ferment, you have to decide what temperature to keep your beers at. Most sours ferment best and fastest in a slightly warmer environment. That being said, they will ferment at lower temperatures but it may be sluggish. Now, it is possible to ferment your non-sour beer at higher temperatures and have the best of both worlds. Strains that work very well at higher temperatures include wheat beers, Belgian strains, and saisons. Doing a split batch gives you one beer that you can drink in a short amount of time and another that you can savor in a year or two. The fruit beer provides an intense bouquet of tropical fruit and a slightly sour undertone. The flavors of the fruit evolve over time, giving you a new beer every few months. The sour beer is a basic Flanders Red, with a nice solid amount of funkiness and a pleasantly subtle sourness that makes this an incredibly easy drinker. Notes: The fruit beer component was racked onto 6 lb of Mango/Strawberry/Pineapple/Peach Mix from Costco after the primary fermentation was complete. The Fruit beer was then racked to tertiary to age. 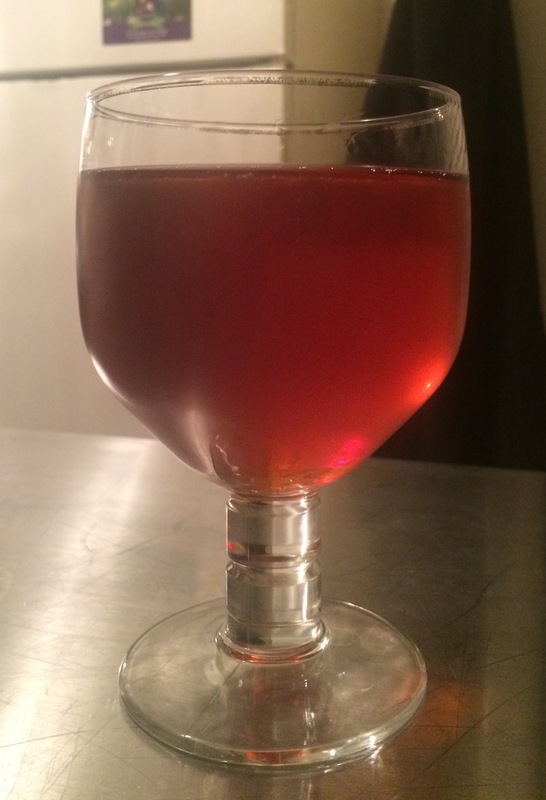 The sour beer was fermented in primary for two months then aged in a 6 gallon carboy for another ten months. After a year the beer was kegged and put on the infamous golden sour tap.